As raindrops pelt the earth it lends impetus to the aroma of freshly soiled mud. There is an artistic quality to this entire process that nature invokes – it helps awaken your senses and rekindle forgotten memories. 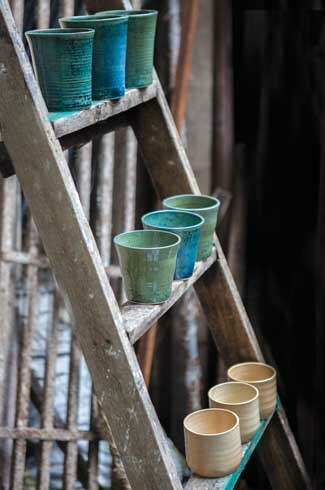 It’s the monsoons and I am at the design studio of Curators of Clay where the atmosphere is equally nostalgic; the setup here resembles a mini-version of a traditional potter’s quarter. However there is a major difference – that being the absence of deities and the presence of functional objects – objects of clay for daily use. Some materials are overtaken by better variants and the rest are lost in the sands of time, but clay has held its own and is a testimony to moments of civility and catharsis, just like a piece of historical architecture which has seen it all. Clay has been the object of creative expression for centuries – from India and China to Russia, the medium has given birth to stories and defined generations of countless lineages. Here we are to take a look at the functional aspects of clay pottery. At each finished stage the material demands cautious negotiation in terms of its treatment – since not only is it docile, but also has a propensity for being easily damaged. Curators of Clay is managed by two people namely Bhairavi Naik and Rohit Kulkarni. Coming from diverse backgrounds of marketing and mass communication the two eventually realised that pottery is their true calling. 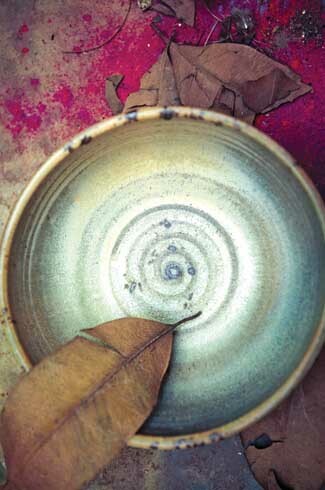 The duo began by working simultaneously under the tutelage of Sandeep Manchekar, a well-known potter himself and later decided to open their own studio in Goregaon, Mumbai. As partners, Rohit manages the marketing aspect of the new franchise whereas finance and planning aspects are tended to by Bhairavi. When it comes to manufacturing the end product Bhairavi has an added advantage – her degree in bio-chemistry (yes, she is an MSC in Bio-Chemistry too) helps in ascertaining that the product gets the right glaze that will ensure many a client’s gaze. Rohit and Bhairavi complement each other in terms of their work and individuality. Though their body of work may be identifiably different, collectively the dance of harmony is at work. They both share a similar inspiration – a love for the Japanese way of interpreting clay which catapults their thoughts to the next creative level. 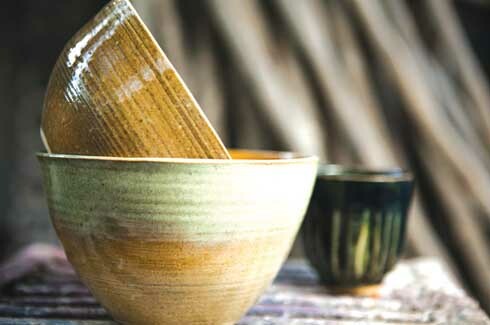 Mingei, the Japanese folk art movement dwells on the beauty of everyday ordinary and utilitarian objects. This idea was developed in the late 1920s and 1930s by Yanagi Soetsu. Another major figure of the movement was Hamada Shoji whose work had a significant influence on studio pottery of the twentieth century. 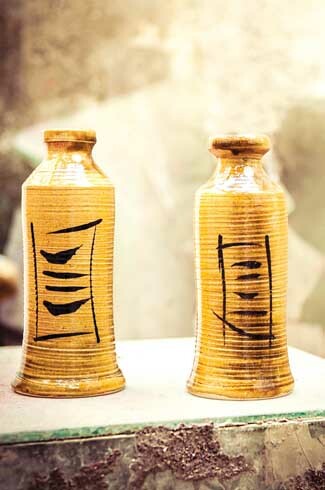 Apart from these Japanese grandmasters the duo is also influenced by British studio potter Bernard Leach who is referred to as the “Father of British studio pottery”. 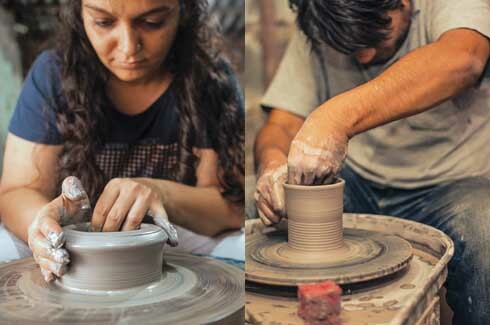 Closer to home the duo is motivated by the creations of Adil Writer, the owner of Mandala Pottery in Pondicherry, Anjali Khanna, a potter from Alibaug and Jugal Kishore of Andretta Pottery in Himachal Pradesh. 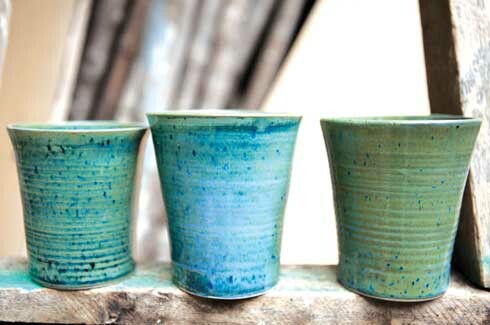 Incidentally Andretta Pottery is the same place where Rohit first honed his pottery skill set. Rohit and Bhairavi have a number of creations to their credit, however, a notable project of Curators of Clay was for Camp Camouflage, an eco-home stay at Kanha National Park in Madhya Pradesh. The client wanted the products to be robust and in sync with the surroundings; the entire set of products designed by the duo included cups, plates, glasses, water jugs and kettles. Currently the duo is working with a proprietor who wants customised pieces for his cafe in Goa. Additionally, the duo also facilitates setting up meetings with craftsmen who cater to different functionalities of clay and pottery which they do not provide. 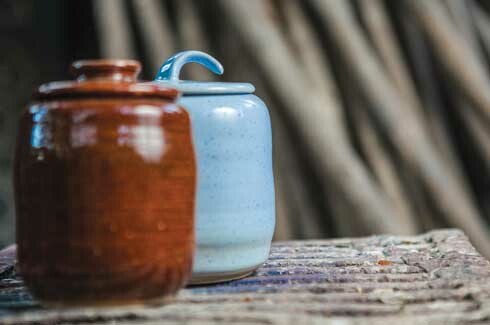 Throughout the interview the duo points out that the art of pottery demands undivided attention. It is also true I must add that the end product creates scenarios of befitting adulation; spreading happiness is an art in itself and it is something Curators of Clay would like to master through their creations.